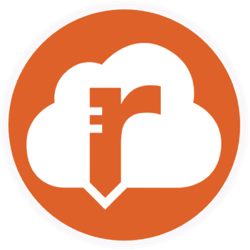 I'm a computer programmer, and I have no idea what I'm doing, nevertheless, when I founded my company, Rebus FM ("Rebus Fleet Management"), I went ahead and designed my own logo. It's basically a lowercase "r" with inverted hints of "F" and "M" embedded. It's in a cloud. The letters represent my company's name, i.e. "rFM" = "Rebus FM" = "Rebus Fleet Management". I'm a low-ceremony, unpretentious, informal kind-of-guy, and I wanted the logo to be informal, too. Also, the product I build is trying to be low on ceremony. So I lower-cased the "r" – to be chill, you know. I really like slightly esoteric logos, so I like the fact that the logo does not spell the name of the company directly. I like how monochrome logos can be varied indefinitely. It's in a cloud because it frames the "r" nicely. Also, I'm in the business of building (and helping people build) distributed software systems, which are often deployed to cloud-based environments, so I thought the cloud was fitting. I am very curious to hear if anyone has any ideas on how I might improve this logo, or if anyone has feedback in relation to e.g. unintentional signals, plain bad graphic design, etc. There is no "M" implied. I have no clue where you may be seeing this. The triangle in the cloud does not convey "M" to me in any way. If anything, it's closer to a "V" than an "M"
That is not necessarily a bad thing though. I merely think you may be so close to the image you see what isn't there, or what no one else will see. What I immediately percieved..... I see "cloud", "r", and the divots in the "r" appear to me to be like the end of a key indicating "security" or "lock". My inclination would be to think it's some sort of cloud-based software security system which is downloaded. If this does not convey the basis of the company, then it may not be the best suited logo for the company. Then again, logos don't have to be literal at all. So some ambiguity can be fine. Increasing the the space between the cloud callout and the bottom of the r. Again to make it more prominent at smaller sizes. Perhaps angle it rather than having a straight triangle, so it's closer to a "chat" callout. Again, if that's a direction you'd like. Based on the web site and the "messaging" and "communication" features of the software, it may be a valid direction of exploration. Perhaps use a different lowercase r which has a more defined ear (or is that a shoulder?). One with perhaps a rounded ear/shoulder to play off the "bubbles" in the cloud, similar to this. 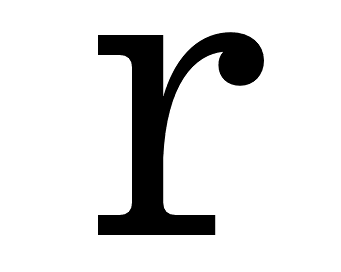 Not this r exactly, but something with the bulbous ear may work better. Using similar rounding in the r would help the overall image "feel" more cohesive. If the goal is to include connotations of an "F" and "M" then perhaps start over. I can't provide any direction off-hand as to how to incorporate such glyphs in this existing image. I'd have to sketch and explore a great deal. The "cloud" icon is exceptionally commonplace today. Using such a well known visual immediately removes a great deal of "uniqueness". This will cause the logo to merely blend into a viewer's spectrum and not stand out or be prominent to any great degree. If you deal in software which integrates with other software, then using something which indicates that more than the "cloud" may be a more unique and viable visual. The web site would indicate the market is not the "average" web user, but a more educated development environment. Using the cloud icon, to me, is more for end-users. It's a "sticker", an "emoji", a "badge", which is seen but never really acknowledged. I wouldn't want my logo to fall into that "user blindness" level. This is all merely opinion. There are no rules and nothing posted in this answer should be seen as a "must do". It's all merely suggestion and what I would explore if a client walked in and asked me to rework this logo. Like the logo. For what it’s worth I do not see the F or M. I see a pencil maybe. I would play with trying to be a bit clearer with what you are conveying. If you are google or a well known brand people will recognize your logo no matter what you do with it. If I’m an up and comer that wants a sticky logo, something people will recall or remember I would try and be a bit clearer. There is something I suppose to evoking curioisity and that dwelling on interpreting the mystery of the logo may work in a kind of unintuitive way but there needs to be a reason for someone to want to solve that puzzle. If you are just introducing yourself to the world IMO it’s fine to be unconventional but you want to be clear as day about who you are. Suggestions? Punch the R out of the cloud. Nest the f in the curve of the r and the m in the curve of the f. Continue to play overall but I would want to have a more clearly defined logo. Your own attempt is solid. But you should use also this place to keep your name visible. Have the cloud, if you see it essential, add some minimalistic decoratives, but keep your name visible! Critique: How can I improve my logo?